Availability: Wednesdays, Fridays and Sundays. Don’t Miss: A delightful lunch overlooking the lovely Green Lake! 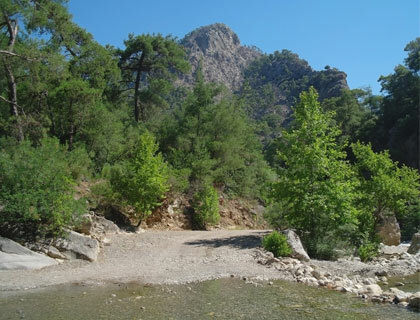 The Cabrio Bus Safari from Side takes you deep into the Taurus Mountains for a day filled with adventure both on and off the water! Enjoy a day of adventure on and off the water. Sail on the Green Lake. Drive over the Green Canyon. Stop at an animal park. Includes round-trip transfers, English-speaking guide and lunch. The first stop on the Cabrio Bus Safari is the Saleukia Roman village which was founded as an acropolis in the 3rd century BC. As Saleukia was built on a hilltop and is surrounded on three sides by cliffs, over the years it became the perfect spot to take shelter from the bandits and pirates who once controlled Side. ...Relax and take in the spectacular scenery as you drive over the Green Canyon, stop at an animal park (mini zoo) and visit a factory outlet on the journey back to your resort – phew! *This excursion includes round-trip transfers from Side, Manavgat, Gundogdu, Colakli, Evrenseki, Kumkoy and Titreyengo hotels, an English-speaking guide and lunch. 8th April to 21st October: Wednesdays, Fridays and Sundays.